Sorry, folks. A couple of days lost to computer and network issues. Microsoft’s signature Windows Vista and wireless networking; need I say more? Moving right along, continuing our Egypt survey …. Touring Egypt 24: Let’s make this Friday low drama (for a change). Here’s a picture that I meant to take and turned out pretty much as I hoped at the time. The subject is not at all dangerous and is so common as to be unremarkable. 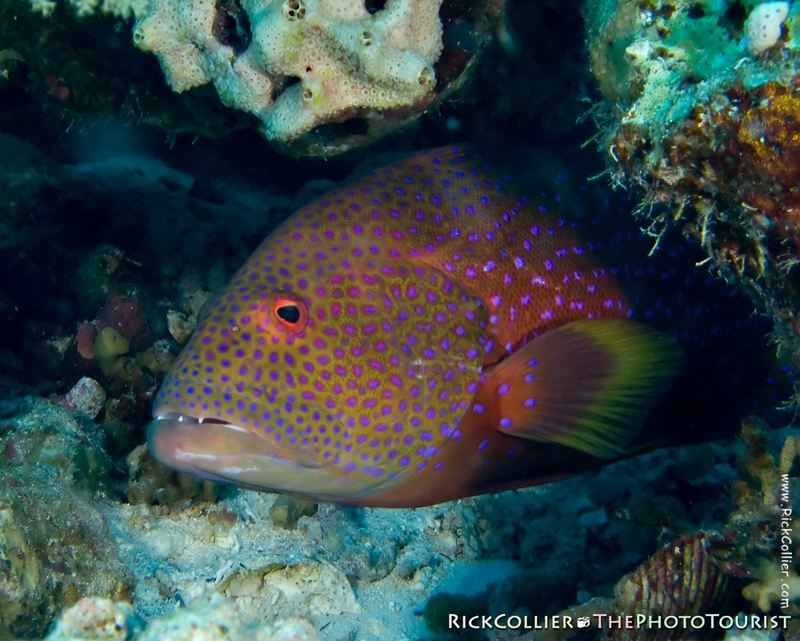 This is one of the several groupers commonly seen in the Red Sea (this one is variously called either “moon grouper” or just “Red Sea grouper”). So this is yet another spectacular sight that is available to everybody visiting Egypt. I had no idea the beauty of this fish up-close until my strobes went off. My fellow travelers (those who braved the deep with me) likewise had never really gotten a chance to see this fish’s coloration in white light. This was a mid-day boat dive on the Woodhouse Reef dive site in the Tiran Straits. The grouper clearly saw me coming as I drifted along with the current but did not move. He had a good hiding place, out of the way of larger predators where he could watch for small prey as the current swept past. I was moving with the current, generally moving in tune with the prevailing flow on the reef. I was carrying my camera in ready position, so I didn’t need to adjust anything or make any sudden moves. I am sure the fish would have bolted quickly if alarmed (my usual experience), but for now it was content to just watch. My strobes went off and the fish was gone — exploding from his hole straight at me, then effortlessly sprinting down the reef. I was left with his portrait, peering from his hideout at the lumbering, bubbling intruder drifting past. And my strobes revealed his fabulous natural colors. This entry was posted on Friday, September 25th, 2009 at 19:35 PM. It is filed under thePhotoTourist, Underwater and tagged with coral, destination, dive, Egypt, fish, grouper, moon grouper, Red Sea, reef, scuba, Sharm el-Sheikh, Straits of Tiran, Tiran, Underwater, Woodhouse, Woodhouse Reef. You can follow any responses to this entry through the RSS 2.0 feed.